Sinai-based militant group Ansar Beit Al-Maqdis has claimed responsibility for attacks on military checkpoints near the cities of Sheikh Zuwaid and Al-Arish on Thursday which killed at least five soldiers. In a statement published on Twitter as well on several pro-jihadist websites the group said it launched simultaneous attacks on several checkpoints on the highway between Al-Arish and Rafah city using automatic guns and RPGs. The group, which was designated as a terrorist organisation in 2014, added that the attack resulted in the killing and injuring of dozens of security personnel. A spokesman for the armed forces, Mohamed Samir, announced on Thursday that 5 soldiers were killed in the attacks while 15 gunmen were killed in the military operation that was launched in the area following the attack. According to other reports, two civilians were among the dead, and 19 security personnel and ten civilians were wounded. 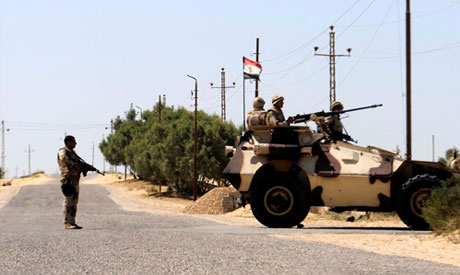 Egypt's army is fighting an Islamist insurrection based in the northern part of Sinai Peninsula, which has heightened since the ouster of Islamist president Mohamed Morsi in July 2013. The violence has mainly targeted security forces, killing hundreds. Hundreds of alleged militants have been arrested or killed in the military campaign launched to combat the violence. Ansar Beit Al-Maqdis pledged allegiance to Islamic state in November 2014 and changed its name to Waliyat Sinai, although in the Egyptian media it is still commonly known by its original moniker. Thanks AO. The rule of engagement require the foot soldier standing behind should be acing the opposite direction to protect the rear end of the armed vehicle. It shows that his officers lack military education or stupid. the repeated attacks by terrorists show our military leaders lack innovations and education in warfare against terrorists. Tahya Misr.